SHERMAN OAKS, CALIFORNIA, UNITED STATES, August 24, 2018 /EINPresswire.com/ — Houston, TX (July 2018) … Xia Xia Zhang, recipient of the Global Music; Gold Medal “Emerging Artist” Award, as well as numerous other worldwide accolades, has commercially released her rendition of Cesar Franck’s Violin Sonata in A Minor: II Allegro. To better grasp the talent of Xia Xia Zhang, it helps to recognize that in 1996, the Chinese Musician’s Dictionary deemed Xia Xia a child prodigy. 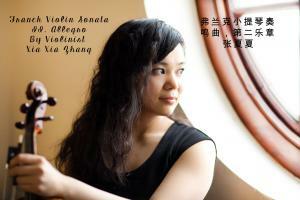 She was born into an artistic family, with her father being a professional violist in a state orchestra. From age of three he began sharing his knowledge of classical music with her. As she grew up, her talents grew, earning herself a full scholarship to London’s Royal Academy of Music in 2007. She earned a Doctor of Musical Arts by the impressively young age of 27. While at the Royal Academy of Music, Xia Xia excelled, achieving accolades such as the Hami-Kanga Award for extinguished violinists at the academy and the Fleming Prince of Wales Award. The latter resulted in the Prince of Wales Trust taking on responsibility for a huge percentage of her scholarship. She was appointed as a cultural exchange ambassador between China and the United Kingdom during her stay years at the Royal Music Academy, and performed at numerous events hosted at the China embassy in London. Her excellence at the embassy even earned her an opportunity to play for the royal family and government officials in London. Aside from the strong foundation laid by her father, Xia Xia expresses deep gratitude to her mentor, Professor Maurice Hasson, as well as the entire community at the Royal Academy of Music for helping her to develop her techniques as a musician and always kindling the fire which is her love for classical violin. The support of her family and community has given Xia Xia strength and confidence, allowing her to continuously receive her well-deserved recognition and praise in the world of Classical music. Xia Xia believes strongly that “music is a universal language from God,” and booking an event to showcase her talents equals offering the community an opportunity to come together and for all to enjoy the masterful and elegant violin melodies of Xia Xia Zhang. With mainstream music being flooded by pop, hip-hop, and electronic music, Xia Xia’s sound is refreshingly romantic and reflects her deep love for classical violin. Hear her music on YouTube, SoundCloud and NoiseTrade for a free download at http://bit.ly/MP3free.